Funny thing. I wasn't a fan of GNR when the video for Welcome To The Jungle first dropped on the airwaves of MTV. 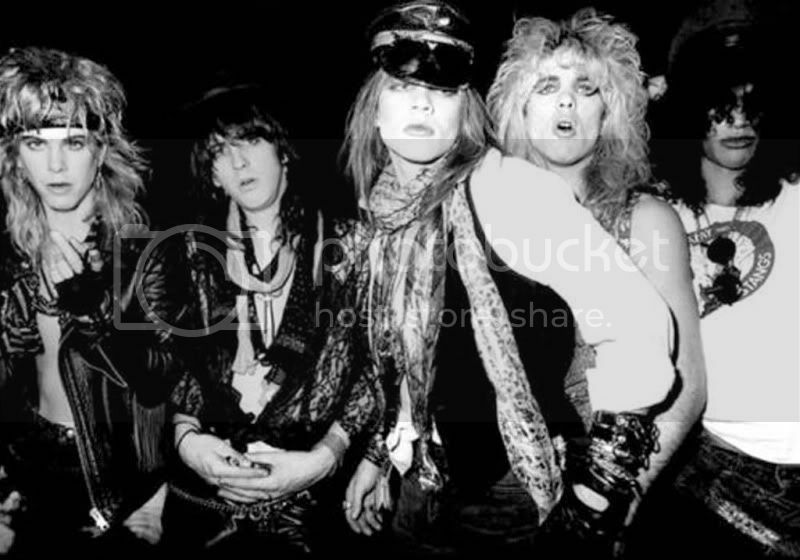 I was still in the throes of the glam era of metal and this was just to hardc*re for me. Haha. I'm kidding. These guys hit me like a ton of bricks to the face, that's still being felt to this day. This is the greatest debut of any artist in the history of music. 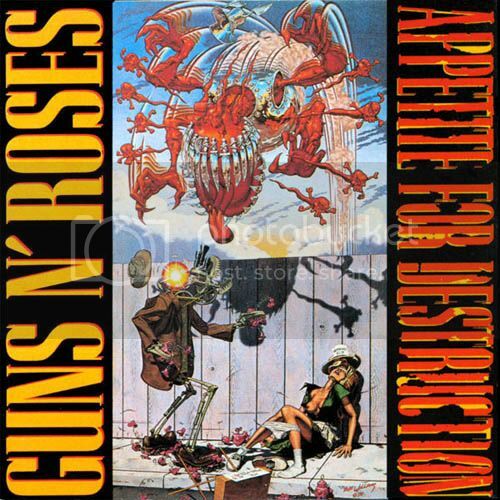 You will not find a better debut with such a lasting impact than Appetite For Destruction IMO. Every damn song has a purpose here. There isn't a wasted 3 minutes to be found. There's really nothing I can say that hasn't already been said about this album, other than a personal story about it. Back in the day, one of my friends "hardest/heaviest" groups he would listen too was.....Huey Lewis And The News. I s hit you not. He considered them to be a hard rock band to the fullest. Enter moi. I turned him on to Appetite. He converted. Suddenly he was obsessed with GNR and then moved onto Metallica and others. My job was complete. Hahahaha. Personal Fave songs: Welcome To The Jungle, Mr Brownstone, Paradise City and that uber power ballad Sweet Child O'Mine. I've been playing this album non stop since the day it came out. Can't believe its been that long. There are so many great tunes on AFD that to me it's a Greatest Hits set. 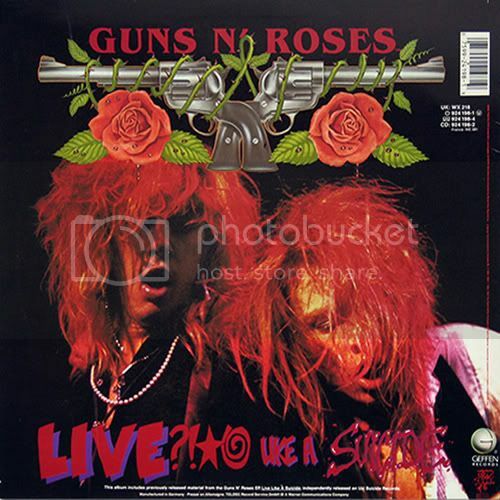 From Jungle to It's So Easy to Mr. Brownstone to Paradise City to one of the greatest ballads of all time, Sweet Child O' Mine. I put this right up there with Motley Crue's Home Sweet Home. Man, I remember first time learning the opening lick to Child and thinking I was the coolest motherf ucker on the planet. The album cover, no matter which one you go with is heads and shoulders above most covers out there. I definitely rank it in the top 10 of all time. Inner Sleeve Side A (The one on the left) was the original cover, but due to it's graphic depiction of robot ****, the record company settled for the eventual replacement. And even the replacement is nothing to sneeze at. Top 10 baby!! 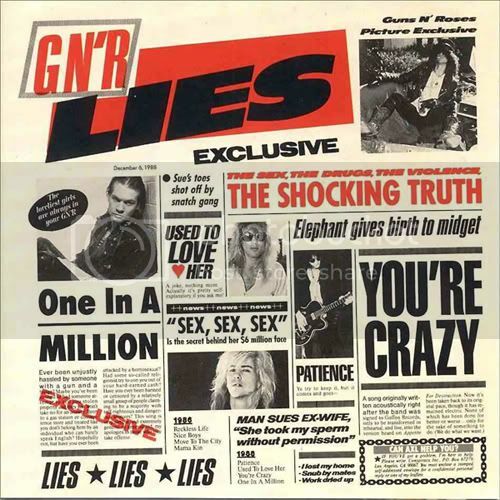 GN'R Lies isn't what I would call a great record by any stretch here. But it's not bad either. Originally I picked it up for Patience. Sure it wasn't the best GN'R song ever, but I liked it enough to go ahead and get it. Over the years the song just keeps getting better and better IMO. Acoustic Guns is definitely a 180 degree turn, coming off of AFD. This record is basically 2 EP's put together. The first 4 songs come off of their independent released EP Live ?! *@ Like a Suicide. 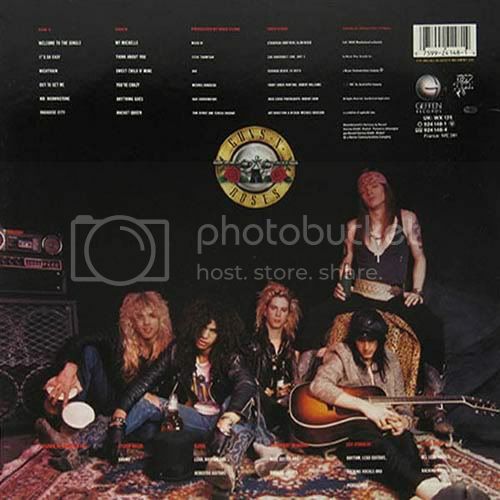 The other half of the album is 4 acoustic songs that comprise GN'R Lies. Fave Songs: Patience, Used To Love Her, You're Crazy and One In A Million. MVP goes to...Patience. Album cover is meh. But props to the inner sleeve. The one they never made. How the f uck does any band follow up Appetite For Destruction? That's a damn near impossibility. 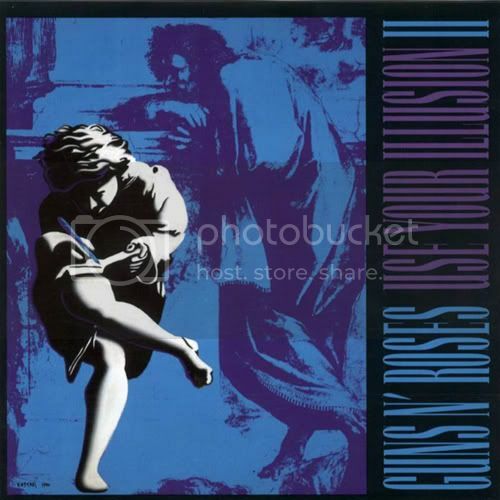 I really didn't know what to expect from Use Your Illusion I and II at all when I went to pick it up at Midnight when it dropped. As for this UYI I, it was a good album, just nowhere near that of AFD. It had its moments, but the first half of the record is just above average. 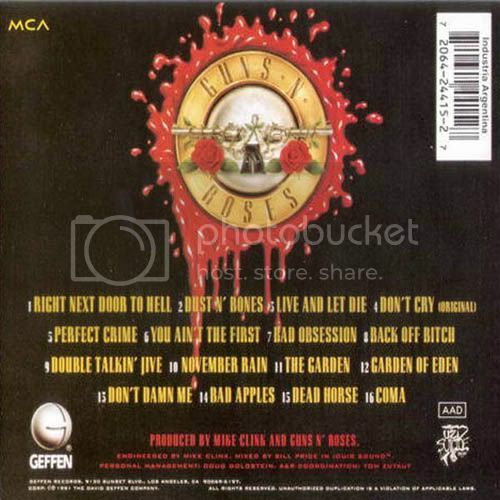 It wasn't until the 2nd half that we got some good sh*t, namely November Rain, The Garden, Don't Damn Me, and probably the best cut on the album, Coma. I seem to have a love/hate relationship with this one. Sometimes I love everything about it and other times it just seems meh. At least the first half of it anyways. Personally I just prefer UYI II over UYI I as it has my favorite songs from the double CD. The above review pretty much sums it up for me. One thing about going to the Midnight opening for Use Your Illusion, I think this is the only time I have ever done so for an album release. There may have been another one or two, but I can't recall at the moment who they were. But for this one it was pretty cool because I went straight to Tower Records right after work and there were tons of people already waiting in line with a couple of news crews filming and I ended up running into a long lost buddy (Richard) of mine who I hadn't seen in years. We ended up talking a lot about music while waiting in line to get into the store. We talked a lot about Ozzy Osbourne and the No More Tears album. As for Use Your Illusion I, the problem with it is that it's way overproduced and that all falls on Axl's shoulders. And the mix is another thing that did (still does) bother me regarding Izzy Stradlin's guitars which are non-existent. Also, the overall feel and style of this one is a drastic departure that allienated a ton of fans. I for one have just accepted the fact that AFD was a one in a million album and no matter how hard the band tried, would never ever be able to equal it. So I just accepted UYI for what it was/is. I do think that UYI I is the ugly stepchild of the two albums. Others may disagree. Album cover is meh. It's easily recognizable for sure. But they could have put a little more thought into it. This was after all their first full album to follow their mega hit AFD. A lot of people for some reason prefer Illusion I instead of II. Not me, I find this one to flow better and have better songs. It might be that II was "bloated" and that long time fans gravitated to the other one because it was as close as it was going to get to AFD. As for Illusion II, it was and is over produced with epic songs that to the average listener would say are way too long in run time: Civil War, 14 Years, Estranged. Not to me. I love that they are longer than the normal song. I don't want 2 minute songs. Leave that to the Ramones. Personal faves: Civil War, Yesterdays, Knockin On Heavens Door, Don't Cry and my all time fave for both Illusions...Estranged. Side note: This was the first and last time I ever went to Tower Records (or any other record store for that matter) at midnight to get the first copies sold to the general public. It was fun. A lot of people showed up. It was very festive, party-like atmosphere. The local news was covering the whole thing. Need to find VHS tape of me on the news. 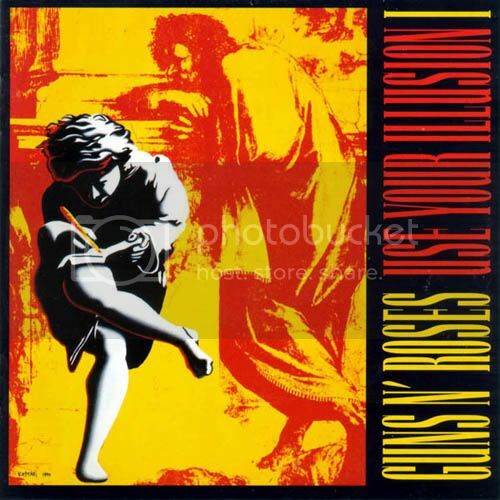 Use Your Illusion II was released at the same time as I. Both I & II is basically a double album...sold separately. 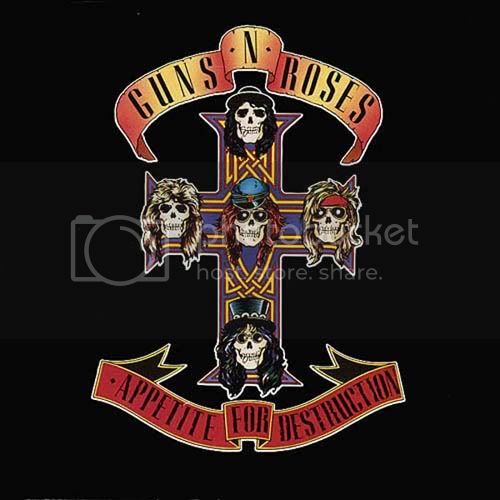 Where UYI I was written before Appetite For Destruction, UYI II was written during and after AFD.The main selling point for me to pick this up was soley for the song You Could Be Mine. I was salivating getting the song ever since I first heard it used in Terminator 2: Judgment Day. As mentioned in my original review, I tend to listen to this one more than I do the other. Sure, it's nowhere near that of AFD, but I have accepted it for what it is. I get why both albums are not held in high esteem because I don't hold either one up to the level of AFD. Having said that, there are still some great songs on here. More so than UYI I. As great as AFD is though, I will say that Slash has some of his best solos found right here, saving his best for Estranged. Gotta give props to Get In The Ring. When I'm feeling pissy and need something get me going, this one does a damn good job. If there is one song I would drop all together it would be My World. Never have liked it and I find it pointless. Same opinion about Use Your Illusion I applies here. The title of the album was the focus of a joke on an episode of the sitcom Arrested Development that aired well over a decade after the CD's release. When magician Tony Wonder (played by Ben Stiller) had to come up with a name for his home video, he decided to name it Use Your Illusion II, citing that Use Your Illusion I had already been taken, apparently unaware of the fact that Use Your Illusion II is also the name of an album. In the end, he used the title Use Your Allusion. The Spaghetti Incident is a album made up entirely of cover songs. 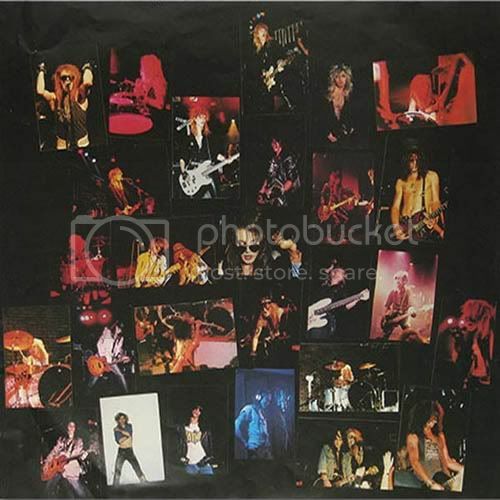 It's the last album to feature Slash, Duff McKagan and Matt Sorum. 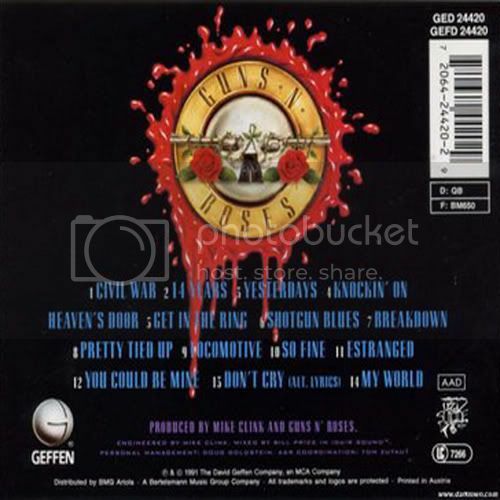 And it would be the last "Guns N' Roses" album till 2008. This is the least played album for me. I hardly ever play this one. I picked it up mainly because of the music video for Since I Don't Have You. The album is ok. Nothing great but certainly not bad. 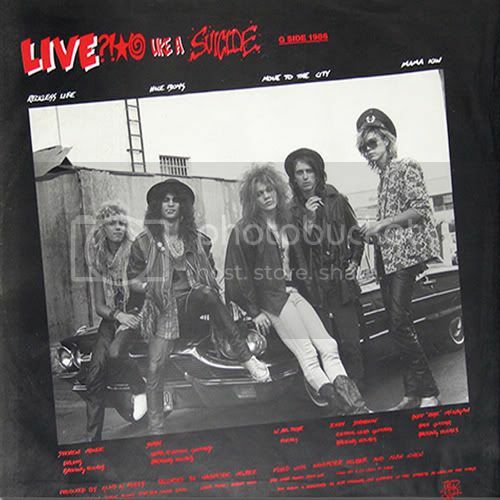 The covers basically are punk and glam tracks that the group grew up listening to. The one big thing about this album is the hidden track that contained the song Look at Your Game, Girl by Charles Manson. 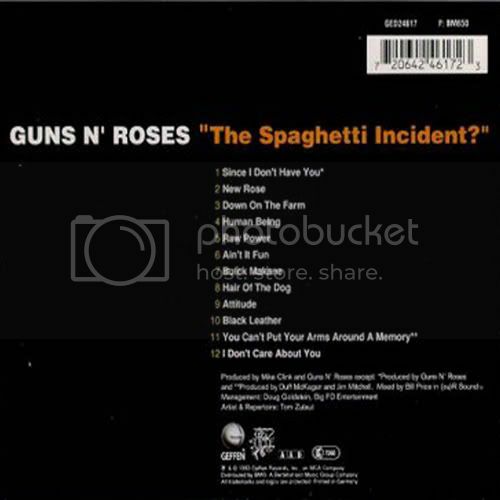 The title is an inside joke referring to a food fight between Axl Rose and Steven Adler involving spaghetti. 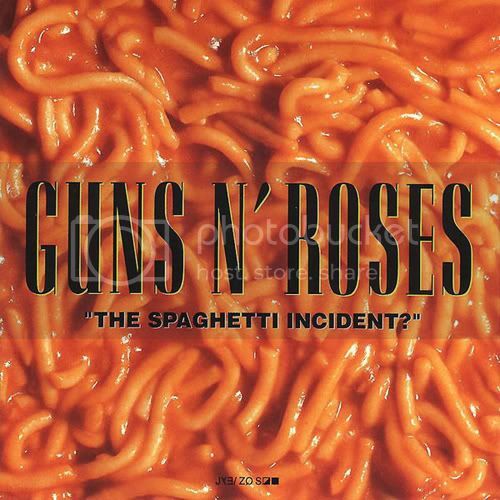 Much was made of this food fight during Adler's resolution lawsuit with the band in 1993, in which Adler's attorney referred to it as "the Spaghetti Incident". 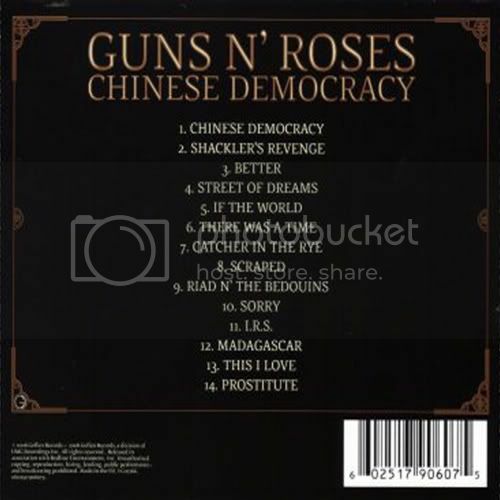 This is a Guns N' Roses album in name only. It has nothing to do with any of the original band members. This should be called The Axl Parson's Project if you ask me. 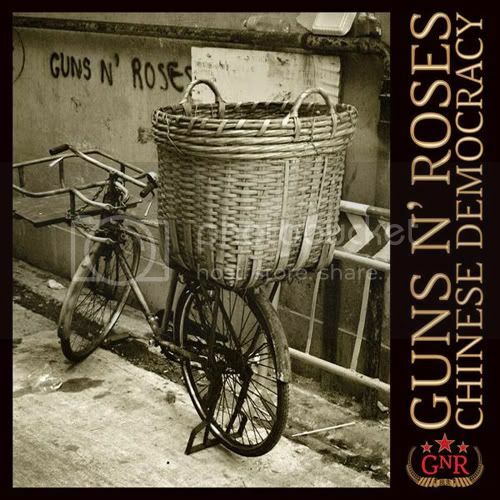 The only time I ever heard Chinese Democracy in it's entirety was during release day and MySpace was having a listening party. At the time I thought the album was ok. It certainly didn't live up to what I had been building up for the past 15 years. But it wasn't a complete disaster either. I do remember liking a couple of songs. But that was so long ago that I really don't remember much of any of it at all. The only song that I do know really well is Shackler's Revenge, and that's only because it's on Rock Band 2. I had every intention of getting the album the next day, but I just completely forgot all about it. Most likely will never pick this up now. I wasn't impressed with Green Day's introduction at all. As a matter of fact, I thought it sucked big time. As for the turn out, somewhat disappointed, but expected. I was hoping that Izzy would be there, but I knew not to get my hopes up on that. He is more of a recluse than Howard Hughes. As for the performances, I actually liked it a lot and I thought it was cool that they let Steven sit in behind the kit. Rough around the edges for sure, but he was having a blast. 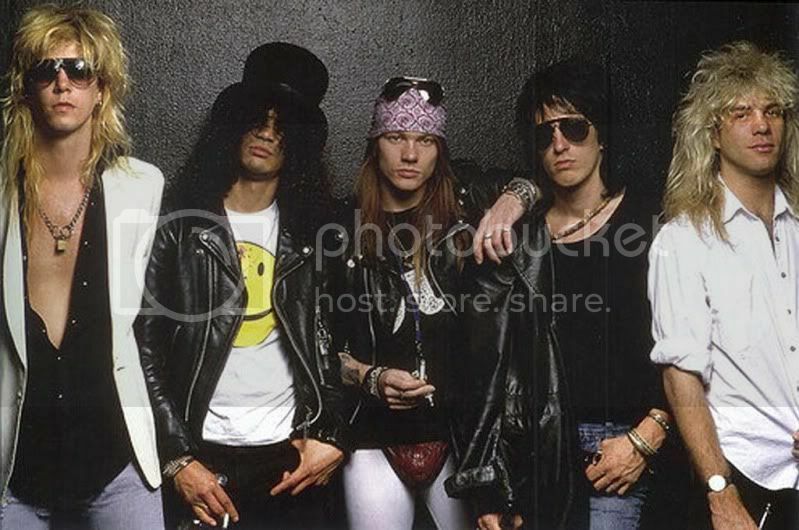 Slash was Slash and so was Duff. But the saving grace for the 2 song set easily was Myles Kennedy. He was f u c k i n g awesome as he usually is. Somewhere in Rio, Axl is agreeing with me. FYI, just to point how clueless the Rock and Roll Hall Of Fame is, they can't even get the image of Duff and Slash on the Jumbo Tron right. They had it inverted, thus making both of them south paws. What the f u c k ! Billy Joe got it right....potentially the best debut album ever...although Van Halen could be argued to be a close contender. How many times do you think Axl watched this. there's a HUGE chance if you post on that thread Axl will read it. you should post your thoughts.....he's looking around at this stuff to see what people are saying. Matt Sorum has morphed into fat Michael Schenker...what happened? ?